steeled in the furnace heat. I hope you had a most excellent holidays! It’s a brand new year, and we have so much to look forward too. For me being in the Yukon is a real blessing. It’s the place where I can really enjoy big snowy winter and possibility to practice outside in wilderness as nowhere. Such training makes the life truly challenging and grateful. 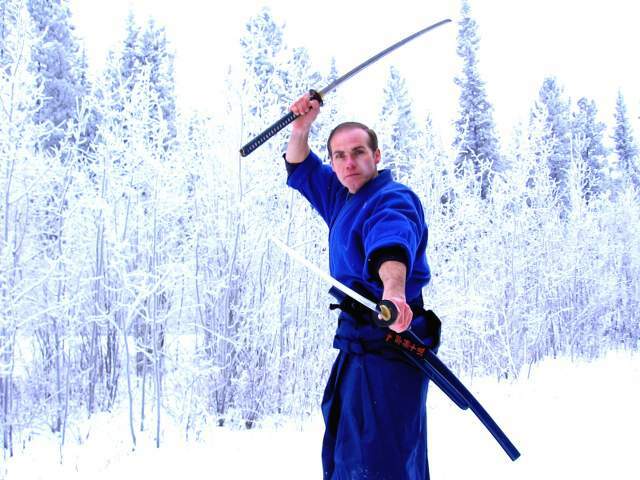 I believe also that such practice where one is forced to train both mind and body in the dead of winter when temperature sometimes drops down below -30 or even -40’C belongs to all traditional arts of warriorship of the North, so we shouldn’t avoid it. Here you can truly test yourself, your stamina, your determination, and will-power. In Japan such training is called “Kan-geiko”, it is truly meaningful, particularly in the disciplining of one's mind/character. I believe that training of mind and body through martial arts in occasionally extreme environment like winter or hot summer can be powerful and very effective tool if employs the concept of the Way/Virtue we inherited from the ancient warriors and the Christian heritage. Honestly saying, I am more impressed by pursuit of the Way and virtue through hard training of mind and body and spirit in the deep snow rather than in comfortable and warm dojo. We should never forget that action is a high road to self-confidence and esteem. Having been living in USA and now in Canada where I revived “Yeshua-Do kan-geiko” I observed that only a few people were interested in the training. Most were impressed by talking about challenges but chose sitting at their homes watching TV or playing with computer, which really saddens me. Recently I even thought about giving various prizes to those who would attend all the ‘kan-geiko’ sessions with me, but I gave up and decided only to come up with an idea to encourage people to try at least once or twice a week for their own good sake. Well, if you overcome yourself, you’ll reap all the benefits of your sweat and commitment. Overcoming laziness and self-contentedness with mediocre style of life can be a road to victory over self - resulting in joyful healthy living and regained self-esteem. This new year, like any other year, and everything from economy to fearsome prophecies on down and collapse is trying to steal from us our peace. However we have decided to practice and wish to dispel with a single stroke this dark cloud of pessimism and fear with the clear mind/spirit and strong body regained through “Yeshua-Do kan-geiko”. Don’t be the last one to take that challenge. - MASTER SUN TSU, "The Art of War"
Now I’d like to share my thoughts on the excellent book on strategy written by a mysterious Chinese warrior-philosopher, Sun Tsu 6th Century B.C.– “The Art of War”. This is perhaps the most prestigious and influantial book on strategy ever written. Still is eagerly studied by modern politicians, businessmen and executives as it has been by military leaders and strategists for the last 2000 years. According to an old story, a lord of ancient China once asked his physician, a member of a family of healers, which of them was the most skilled in the art. The physician, whose reputation was such that his name became synonymous with medical science in China, replied, "My eldest brother sees the spirit of sickness and removes it before it takes shape, so his name does not get out of the house. "My elder brother cures sickness when it is still extremely minute, so his name does not get out of the neighborhood. "As for me, I puncture veins, prescribe potions, and massage skin, so from time to time my name gets out and is heard among the lords." Among the tales of ancient China, none captures more beautifully than this the essence of “The Art of War”, the premiere classic of the science of strategy in conflict. A Ming dynasty critic writes of this little tale of the physician: "What is essential for leaders, generals, and ministers in running countries and governing armies is no more than this." The healing arts and the martial arts may be a world apart in ordinary usage, but they are parallel in several senses: in recognizing, as the story says, that the less needed the better; in the sense that both involve strategy in dealing with dishar¬mony; and in the sense that in both knowledge of the problem is key to the solution. As in the story of the ancient healers, in Sun Tzu's philosophy the peak efficiency of knowledge and strategy is to make conflict altogether unnecessary: “To win without fighting is best” or "To overcome others' armies without fighting is the best of skills." And like the story of the healers, Sun Tzu explains there are all grades of martial arts: The superior militarist foils enemies' plots; next best is to ruin their alliances; next after that is to attack their armed forces; worst is to besiege their cities. Just as the eldest brother in the story was unknown because of his acumen and the middle brother was hardly known because of his alacrity, Sun Tzu also affirms that in ancient times those known as skilled warriors won when victory was still easy, so the victories of skilled warriors were not known for cunning or rewarded for bravery. do what is great while it is small. the greatest things in the world must be done while they are still small. “The Art of War”, written over two millennia ago during a period of prolonged civil warfare, emerged from the same social conditions as some of the greatest classics of Chinese philosophy, such as the “Tao Teh Ching”. Taking a rational rather than an emotional approach to the problem of conflict, Sun Tzu showed how understanding conflict can lead not only to its resolution, but even to its avoidance altogether by making peace. His statement; “In peace prepare for war, in war prepare for peace”, and “The true object of war is peace”, is crucial to understand the purpose of warfare. Perhaps the paradox of “The Art of War” is in its opposition to war. And as “The Art of War” wars against war, it does so by its own principles; it infiltrates the enemy’s lines, uncovers the enemy’s secrets, and thus changes the heart of the enemy. So, “The Art of War” is a book not only of war but also of peace, above all the tool for understanding the very roots of conflict and resolution. As it is said by the warriors of old: “The exercise of kindness in battle leads to victory, the exercise of kindness in defense leads to security”. So to fail to know the conditions/possibilities of opponents because of reluctance or lack of knowledge can be sometimes extremely costly. “Return the sword to its scabbard. In the place where you were created”.